What a handsome young man, and a fast learner. Dolche is a fine looking horse, no wonder you are so proud of him. His photos are outstanding, glad he was on POTD today. Dearest Dolche, you are absolutely gorgeous! What a beautiful young Quarter Horse/Thoroughbred cross you are! You have a delightful personality, and you are learning many tricks and routines with your dear person. You are the first horse to come to her/him in the pasture, and then you follow him/her around like a puppy. You two love each other very much, don't you. What a wonderful love-filled home you share! 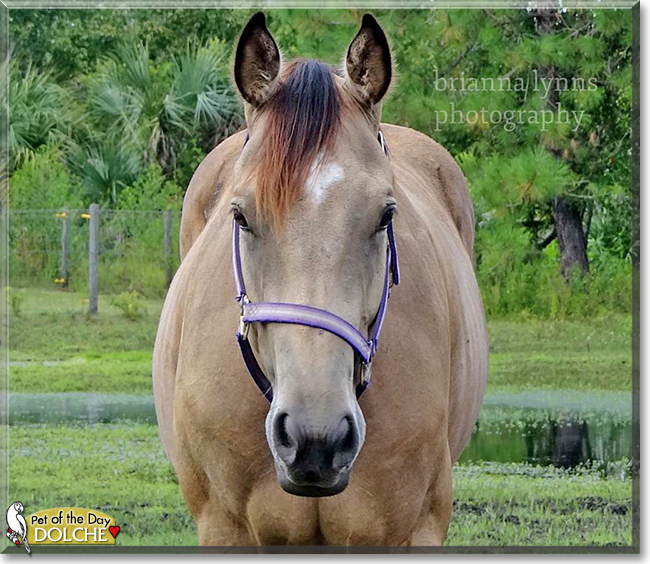 Congratulations, darling Dolche, on being chosen today's Pet of the Day! We hope you and your dear person and all your family and friends are enjoying a fine celebration, full of fun and lovies and all your favorite games and treats. Greetings, Dolche! Happy Pet of the Day! 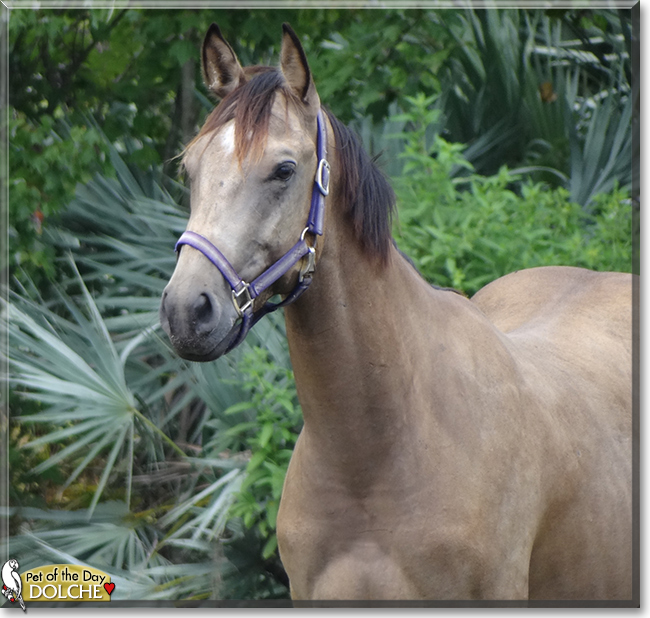 What a breathtakingly beautiful buckskin Quarter Horse x Thoroughbred you are, Dolche! Your coat, your buckskin coloring, are simply stunning! And while I'm not that familiar with horse competition terminology, equine registry lineage, consider me VERY impressed! And no doubt your and your proud human's success in the show/competition rings has only just begun! He is about to turn three and he knows the barrel pattern now! I am excited to see how he turns out as he gets older, I think he'll be a champion barrel racer one day. One of my favorite things about him is he is always the first horse to come to me in the pasture, and he follows me around like a puppy. How very blessed your human is, having a beautiful best friend and devoted companion, a partner in the ring and in life, in you! You truly are a treasure, Dolche, beautiful inside and out, one in a million! Thanks for the BIG smiles, Dolche! I hope you're enjoying a very special Pet of the Day celebration, spending special time with your human, being spoiled to the max and loved to bits! Lots of love and big hugs to you, beautiful Dolche, our very special and most deserving Pet of the Day, EVERY day!!! And please have your human give you a treat, some apple or some peppermints, for me! What a handsome Quarter horse x Thoroughbred you are. I enjoy watching Barrel Racing and wish you luck the future.